During the past decade, members of the Cognition and Technology Group at Vanderbilt University have worked with hundreds of teachers and thousands of students throughout North America in the context of the Adventures of Jasper Woodbury problem-solving series--12 videodisc-based adventures plus video-based analogs, extensions, and teaching tips designed to improve the mathematical thinking of students from grades 5 and up, and to help them make connections to other disciplines such as science, history, and social studies. The experience of developing the Jasper series, testing it in classrooms, and re-designing it based on feedback provided The Cognition and Technology Group at Vanderbilt with extraordinarily rich opportunities to learn from teachers, students, parents, administrators, and other community members. This book was written for two reasons. First, it helped the authors to organize the thoughts and experiences of over 70 members of the Learning Technology Center who worked on the Jasper project, and to collaboratively reflect on their experiences and relate them to the broader literature in cognition and instruction. Second, this book gives others a change to learn from the experiences of the Cognition and Technology Group at Vanderbilt. The book is anchored around their experiences with Jasper, but the issues explored are relevant to any attempt to improve educational practice. This book tells a coherent story that helps readers explore issues of curriculum, instruction, assessment, and teacher learning (professional development) within a single context (Jasper) and how all these topics are interrelated. It also helps readers see the relevance of research programs for improving educational practice. Throughout, the need for maintaining a balance of laboratory and classroom research is emphasized. Contents: Preface. Contents of CD-ROM. Overview of the Jasper Series. The Genesis of Jasper. Jasper from the Perspective of Curriculum Design. Initial Work on Instruction and Assessment. Explorations of Formative Assessment. Teacher Learning and the Importance of Learning Communities. Summary, Lessons, and Next Steps. Appendix A: Story Summary of Rescue at Boone's Meadow. Appendix B: Synopses of the 12 Jasper Adventures. "The book is anchored around their experiences with Jasper, but the issues explored are relevant to any attempt to improve educational practice. This tells a coherent story that helps readers explore different topics within a single context (Jasper) and understand how all of these topics are interrelated. It also helps readers to see the relevance of research programs for improving educational practice. Throughout, the need for maintaining a balance of laboratory and classroom research is emphasized." 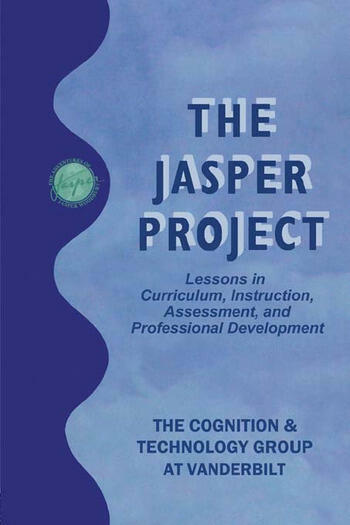 "Classroom teachers can gain from this book, partially by learning about The Jasper Project and more generally by thinking about their own ideas of curriculum development and instruction." "Overall, the clarity of vision of The Jasper Project and the quality of the research and implementation work by The Cognition and Technology Group at Vanderbilt over the past ten years has been outstanding....One can only agree with the closing remark of the book: 'We...look forward to the next 10 years of research--it is going to be quite an adventure!'"